Paul Bleasdale, 32, of Hillcrest Road, Liverpool, assaulted Daniel Cutts in Worksop by beating him. A community order was made and he must participate in rehabilitation activity. He was ordered to pay compensation of £150 and a surcharge of £85. Ivan Macefield, 26, of Cleveland Close, Worksop, admitted driving a motor vehicle on Netherfield Road, with 94 microgrammes of alcohol in 100 millilitres of breath, when the limit is 35. He was disqualified from driving for 24 months and fined £100 with £85 costs and a £85 surcharge. Kayleigh Baxter, 29, of Kenilworth Close, Worksop, admitted driving a motor vehicle on Priorswell Road, Worksop, with 62 microgrammes of alcohol in 100 millilitres of breath, when the limit is 35. She was disqualified from driving for 18 months and fined £120 with £85 costs and a £30 surcharge. 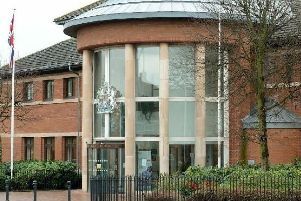 Anthony Newbury, 25, of Clinton Street, Worksop used a motor vehicle on Shrewsbury Road without a valid policy of insurance. He was fined £120 with costs of £85 and a surcharge of £30. He was also issued with six points on his driving licence. Lee Walters, 37, of no fixed address, stole a hoover to the value of £59.99 from B&M Bargains in Worksop. He was committed to prison for 14 days and ordered to pay compensation of £59.99. Luke Pywell, 31, of Garside Street, Worksop, stole detergent to the value of £20 from Home Bargains and lamb chops to the value of £19.96 belonging to Farmfoods. He was committed to prison for seven days and ordered to pay compensation totalling £39.96. Jamie Austin, 37, of Gateford Road, Worksop, failed to give information relating to the identification of a driver who was alleged to have committed an offence. He was fined £660, with a surcharge of £66 and costs of £85.